SQM’s new investor slide deck and industry outlook by Daniel Jimenez, SVP for Iodine, Lithium and Industrial Chemicals released this week throws down the gauntlet on its competitors and appears purposefully designed to scare off any junior seeking to enter the lithium market. Most appeals by mining companies to investors do not start off with a statement of just how “abundant and well spread geographically” the chosen raw material is. SQM’s new investor presentation goes further and repeats the tidbit in its concluding bullet points. And that brown and greenfield projects around the world outnumber existing mines. Or the insignificant size of the market. SQM believes even after a decade of torrid demand growth lithium would only amount to 6% of the value of the copper market. 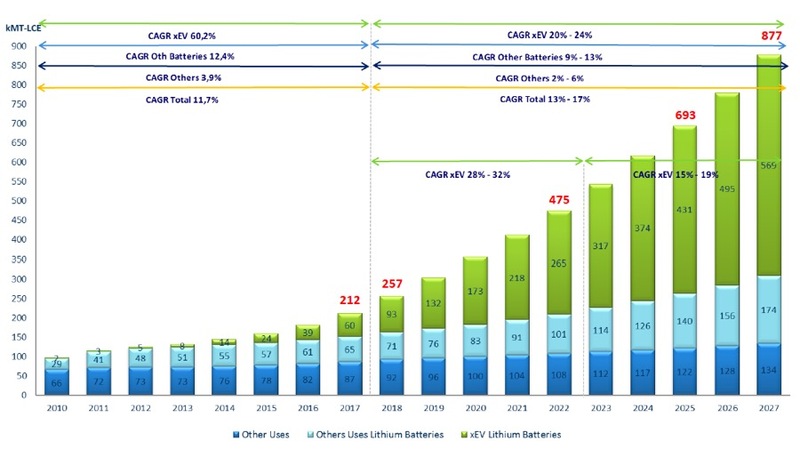 While no-one disputes that renewable energy storage, especially the growing electric vehicle market, is driving a boom in demand for lithium, SQM’s growth forecasts are modest. The company foresees demand for lithium growing at a compound annual rate of between 13% and 17% over the next decade. That puts it in the same forecast camp as the investment bank that sparked this year’s lithium stock sell-off. Not surprising given the aforementioned SQM is predicting an oversupplied market, forecasting 2022 supply of 735,000t LCE, but meagre demand of 475,000t that year. 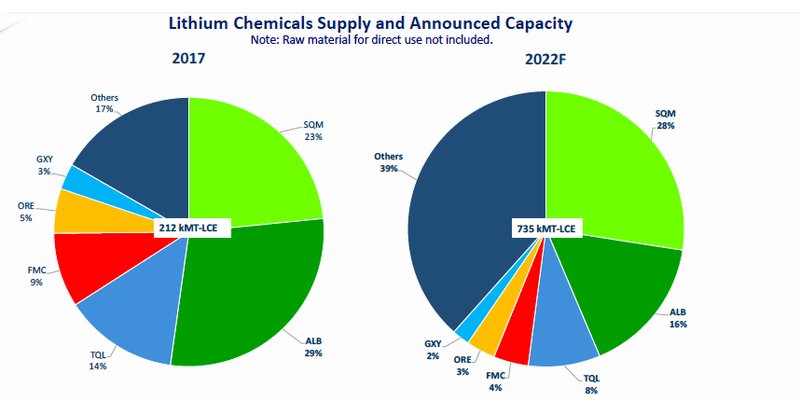 In another sign of self-confidence SQM predicts it will “take back the #1 global lithium producer” spot by 2022 and claim 28% of the global market. Cutting off current and prospective competitors at the knees is not exactly a novel strategy (behold iron ore) in commodities markets. And SQM has done this before. It kept its iodine prices not far above production costs, driving out smaller players and capturing nearly a third of the market in the process. 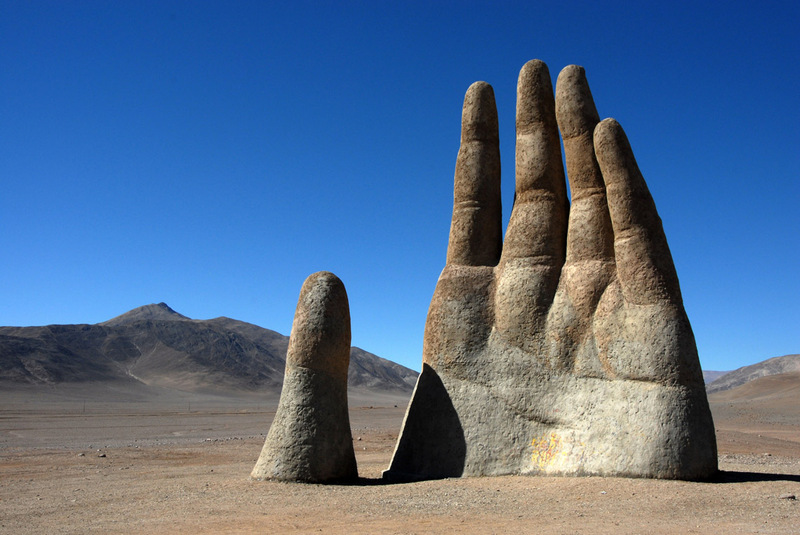 Like lithium its iodine reserves in the Atacama is vast and cheaply exploitable.